Finally A Permanent Solution For Outdoor Wood, Concrete Decks & Porches Is Here! Deck Renew Coating Will Restore The Beauty Of Your Decks Or Porch With 60 Beautiful Colors And Never Chip Or Peel Off! 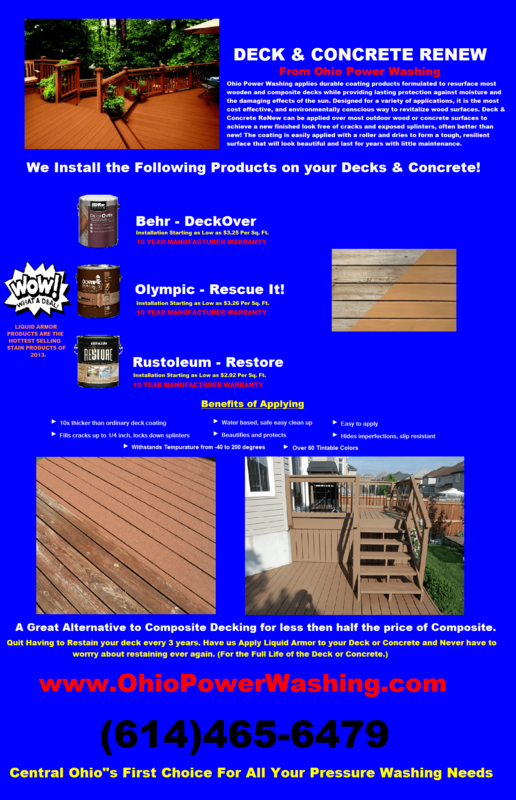 Deck & Concrete Renew is a durable coating product formulated to resurface most wooden and composite decks while providing lasting protection against moisture and the damaging effects of the sun. Designed for a variety of applications, it is the most cost effective, and environmentally conscious way to revitalize wood surfaces. Deck & Concrete Renew can be applied over most outdoor wood or concrete surfaces to achieve a new finished look free of cracks and exposed splinters, often better than new! The coating is easily applied with a roller and dries to form a tough, resilient surface that will look beautiful and last for years with little maintenance. Q: I live in a northern climate is this product suitable for areas that have large temperature swings and large amounts of snow? A: The coating once cured has a temperature rating of -40 degrees to 200 degrees. Renew is extremely flexible so temperature swings have no effect on the coating. That is what sets Renew apart from all other coatings. It wears like Iron, it breathes and flexes so as not to chip, crack or peel like every other normal stain deck coating. We do not recommend applying the coating in temperatures below 40 degrees or above 100 degrees. Snow and Ice have no effect on Renew either. Renew is tough enough to handle snow shoveling, we do recommend that you use plastic or fiberglass tipped shovels when shoveling snow right down to the coating. As you can imagine a steel edged shovel slammed into any surface will scratch or gouge even concrete. Q: Is this a different coating than your concrete coating? A: The Renew coating is good for both wood or concrete surfaces, including Pool Decks. The only difference is in the prep work. You need to clean and etch concrete surfaces prior to applying the coating. Renew Coating is still the same extra thick super durable coating that will Restore your Wood or Concrete Decks by filling in and covering cracks, chips, stains, knots and other imperfections! Q: Can you provide custom colors? A: Each separate manufacturer offers around 60 base colors. Each one of these base colors can be tinted to make a custom color. Olympic Rescue it! can be tinted to match any color you would like. Q: What is the surface prep needed, how do I apply it and can I apply it in direct sunlight? A: Renew Coating can be applied on top of other coatings. If your deck has been previously stained we recommend a strong power washing to expose as much of the wood surface as possible. If the deck has been previously coated with a paint or similar coating it is important that the coating is firmly bonded to the deck. If the existing coating is peeling over a majority of the deck it is best to remove it completely either by power washing, sanding or our wood stripper. If only a small portion has become decontaminated then do a strong power wash to remove any weakly bonded coating and then sand the remainder of the coating to provide a rough surface for the Lifetime Coating to adhere to. Once all dirt, loose coatings, mold and mildew are off let the deck dry out for 48 hours. Concrete surfaces must be etched. A acid wash of the concrete is performed before the Renew product is applied. Q: How do I clean it?. A: The finished surface is easy to maintain and clean, all that is needed to clean the coated surface is a mild liquid soap and garden hose. A light pressure washing up to 1200psi is also alright to remove any heavy ground in dirt and grime . You can also use a fiberglass edged shovel to remove any snow during the winter months. Q: Is it slippery when wet? A: No. In fact it is quite the opposite since it has a grainy type finish. It is a very non slip type of finish and will have the feel of a very fine emery board on bare feet that is very comfortable for walking and barely noticeable, it’s great for pool areas and it’s even comfortable for pet paws! It can also be used on stairs and ramps where a non slip surface is desired. Q: What is the coverage and how thick can it be applied? A: Coverage is up to 100 sq ft/gal and you need to do two coats. So each can yields up to 50 sq ft for two coats. This coating is sold in 2 gallon sets, so each set will cover up to 100 sq ft with two coats. Finished coating will be about a 1/8″ thick and you can fill in cracks and divots up to a 1/4″ deep. Remember though that the thicker you apply it and the more cracks and divots you fill in the less coverage you will get. Coverage may vary depending on type of wood, age and dryness of your deck. A: Warped boards may require us to roll perpendicular to the boards first then roll parallel to the boards to ensure material gets down into the valley of warped or cupped boards. Q: Do I have to protect my landscaping? A: No. It’s 100% non toxic. Q: Can I do the entire deck with this? A: Yes it can be used on the entire deck, Vertical posts and railings do not get the same damage and wear as the floor so we use a smooth version of the coating that is available in the same exact colors for the maximum protection of your posts and rails. A: Most Products have a limited lifetime warranty on product failure. It is more a questions as to how long your boards will last. Lifetime Deck Coating will not peel or chip off your floor boards but depending on the type of boards your deck is made of or the condition and age of the boards are when you coat them, is what will determine the life expectancy of those boards. Lifetime coating is not a miracle coating it cannot bring rotted, crumbling and broken boards back to life. These boards should be replaced prior to coating. Also as with all items exposed to the sun the color will start to fade in 10-12 years at which time you may want to apply one single refresher coat. Q: Can I apply this to pressure treated wood or Trex? A: The answer to both is yes. Pressure treated wood should be allowed to age for 6 months to allow complete out gassing. Trex should be Primed with Primer first. This is a great application for Trex since Trex is the best material for longevity but most people don’t like the look of it. Now you can have good looks and longevity! Q: Can it be applied to untreated wood? A: Yes, it’s best on untreated wood and it’s the best long term protection you can put on untreated wood which normally rots out fairly quickly. If possible we suggest you seal the underside of the boards with any typical Home Improvement type sealer to reduce rotting from underneath. Since the under side of the boards are not exposed to sun or traffic residential grade sealers should last a good amount of time and this will extend the life of the wood.